In practice there is no reason to make the stock separately. If you want to use it as a base for an easy soup, then just pour all the ingredients, and any vegetables and meat in the same pot and bring the vegetables to a boil all together. That is usually easier. Chicken powder can be purchased in Asian shops and is called "chicken powder" :-S. the most common brand is Knorr's. However, it is somewhat easier to use than bouillon cubes, it tastes better and Asian chefs use it without shame. This fake stock can not be reduced into a sauce, but is good as a strong basic stock in soups. In particular, vegetable and fish soups. If you throw a chicken carcasses in and simmer it along for ½ hour it will certainly only make it better. A piece of smoked ham or bacon is also good for extra flavor. The stock is reasonably powerful and salty. You can always dilute with some extra water if it is too strong for your taste. It wont be less powerful when there is eg vegetables and fish, wait with the diluting until the end. The fake stock is inspired by the Japanese miso soup, which is basically the same. Dashi (dried and smoked fish) are replaced by fish sauce and miso paste (solid residues from soya production) is replaced with soy sauce. The sea weed (provides umami taste) is replaced by chicken powder. Smoked bacon / ham gives the smoke flavor that would otherwise be in the dashi. 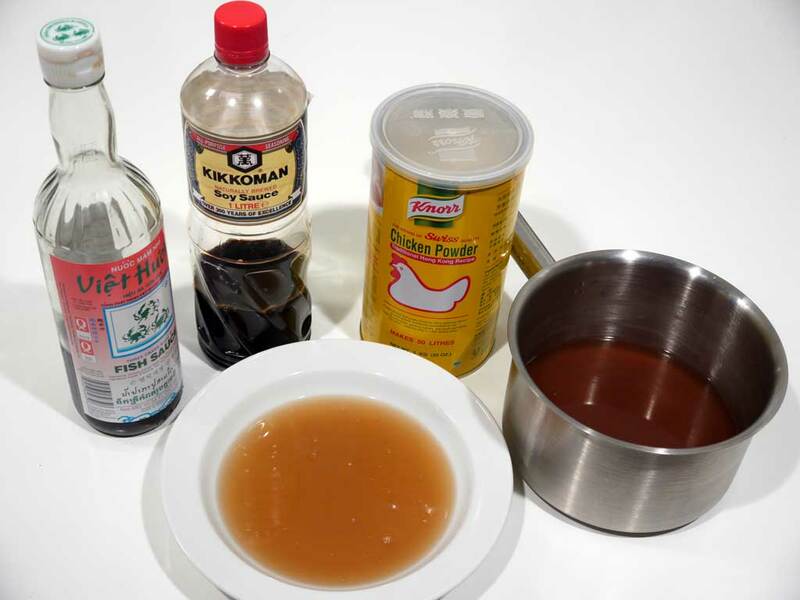 It goes without saying that you should use good soy sauce and fish sauce for the best flavour.